Phi Phi Hotel on Phi Phi Island was our choice for the family Christmas break. With 4 families including grand parents, 4 kids and 2 infants was a big enough group and phi-phi.com sorted out our booking with no problem. Phi Phi Hotel is a 4 storey hotel building right next to the main pier in Tonsai Village. It was a simple walk from the Sea Tran ferry from Phuket and the porters carried our bags ( and kids ) on the trolley carts. Checking in was straight forward with a signature, home address and passport number and we soon had our hotel room keys and direction to our rooms (Not everybody had a porter to their room). The Mountain View Room had views of the coconut trees, Phi Phi Village bazaar and one room had a glimpse of the back bay (Loh Dalum Bay). 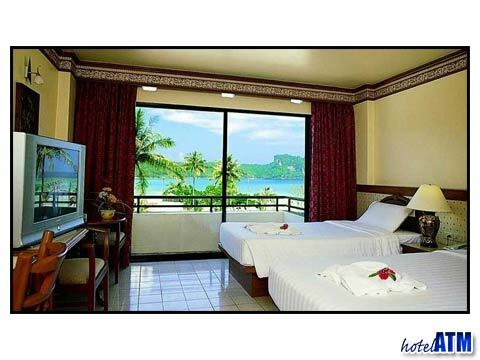 The Sea View Rooms had amazing views of Tonsai Bay cliffs, the coral reefs, the pier and the Bay. The Grandparents had the VVIP room on the 4 th floor and although they didn’t enjoy the walk up the stairs every time (no lift) their room had an extended balcony with a lot of room. The kids settled in quickly, getting to grips with the cartoon network on the TV and generally making a mess so we spent as little time there as possible and spent most of the time on the Beaches, at the pool or taking tours with Siam UK. With about 70 rooms it is small enough so that you can remember faces of the staff and other guests. Phi Phi Hotel had all the main facilities required. Breakfast was good enough for the kids. The Hotel seemed very busy but as it is so centrally located for everything it made it simple to get around with such a large group. Service was polite if lacking a little with eagerness. The staff were genuinely helpful with the infants and kept them happy while we ate at the Pakarang restaurant. A good stay.